This post was written by Dina Posner, an intern at the Museum at Eldridge Street. Dina is a candidate for a Masters degree in Historic Preservation at Pratt Institute. Shearith Israel’s first building, built in 1730 on Mill Street (now South William Street). Our Museum’s building represents a major Jewish “first” – built in 1887, the Eldridge Street Synagogue was the first great house of worship built in America by Eastern European Jews. But did you know that Jewish history in New York City dates back almost two centuries prior to construction at 12 Eldridge!? We typically think of New York’s Jewish life as flourishing at the end of the 19th century, but Jewish life was here much, much earlier. The city’s first Jewish congregation, Shearith Israel, was founded in 1654. New York wasn’t even New York yet – it was still called New Amsterdam. And the United States, as its own country, was an unfathomable notion. For about a century after its founding, the Shearith Israel congregation met in rented quarters. 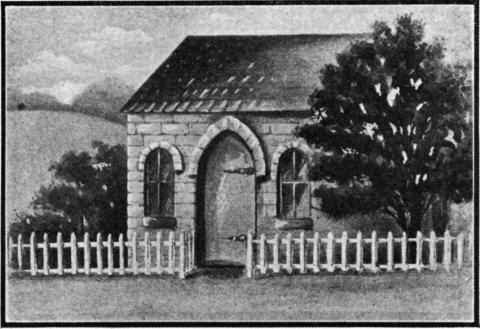 However, Monday, April 8th, 2019 marks the 289th anniversary of the opening of Shearith Israel’s first synagogue building in the year 1730. Sadly long gone, the building was located on Mill Street in Lower Manhattan (South Williams Street). Jews from Eastern European countries are generally referred to as Ashkenazi. The congregants at Eldridge Street Synagogue were Ashkenazi immigrants living on the Lower East Side. But there are other Jews – from Spain and Portugal (the Iberian Peninsula) – who are generally referred to as Sephardic. These Jewish immigrants immigrated to New Amsterdam and other areas much earlier, typically, than Ashkenazi. Shearith Israel was founded by about 23 immigrant Sephardic Jews that had made their way to New Amsterdam from Recife, Brazil. Political upheaval in Recife brought about religious changes as well, so the Jews of the area left for freer pastures. 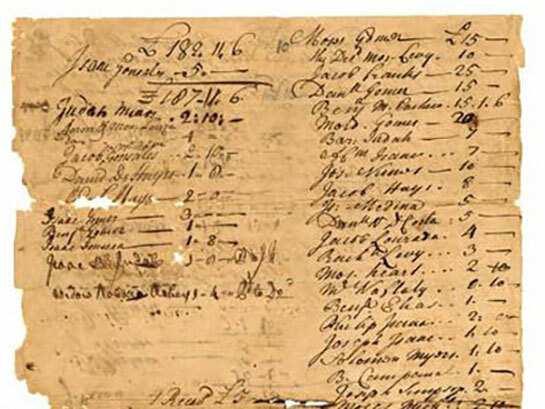 This fundraising ledger lists the Shearith Israel congregants who pledged funds for their first building’s construction. Once in New Amsterdam, Sephardic Jews were not initially welcomed by Governor Peter Stuyvesant. But the small group stood their ground and fought for their right to stay, and stay they did. Shearith Israel was the only Jewish congregation in New York City for a remarkably long time – 1654 to 1825 – and welcomed both Sephardic and Ashkenazi congregants. As the Jewish population in New York grew, Shearith Israel needed more space to host literally every Jew in the city. By the time Eldridge Street opened in 1887, Shearith Israel was already on its fourth synagogue building! That building, a stately Palladian-style edifice on the corner of Nineteenth Street and Fifth Avenue, is also no longer there. But after leaving the Nineteenth Street Synagogue behind, the congregation moved further uptown to a grand neoclassical structure with interiors designed by famed artist and designer Louis Comfort Tiffany. This structure, located at 70th Street and Central Park West, is still utilized by the congregation today! For a long time, the only physical reminder of Shearith Israel’s long history in Lower Manhattan was cemeteries. The congregations oldest extant cemetery is known as the Chatham Square Cemetery, and is located at 55 St. James Place, just around the corner from Eldridge Street Synagogue! (Take a look at this Village Preservation blog on all the congregation’s Manhattan cemeteries.) The cemetery is one of the oldest burial grounds in Manhattan, only a small portion of the Trinity Church cemetery predates it. But since April 8, 2019, cemeteries are no longer the only marker of the Jewish history downtown! 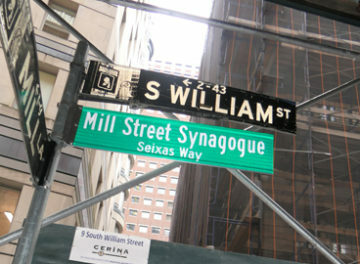 After lacking significant formal recognition for decades, South William Street was officially given the honorific street name “Mill Street Synagogue/Seixas Way” commemorating the synagogue’s time on the street and one of its first clerics, Gerhson Seixas. He was an important patriot leader during the American Revolution, and is buried at the Chatham Square Cemetery. 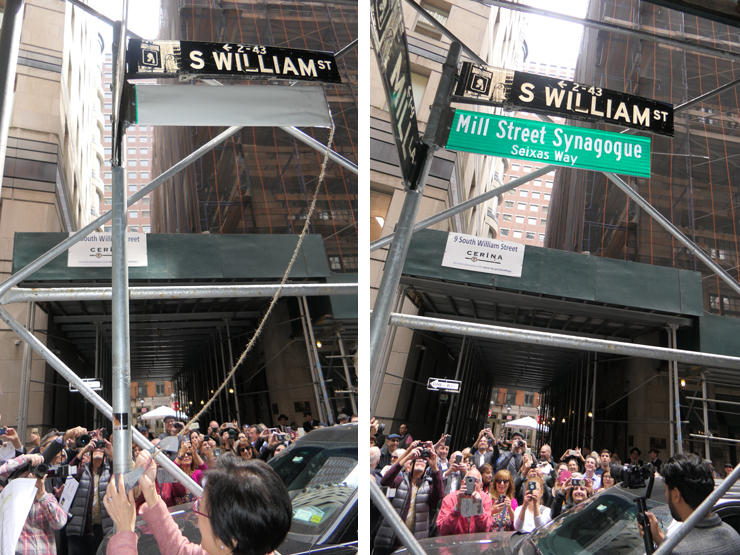 City Council member Margaret Chin and many others gathered on South Williams Street to celebrate the co-naming. Now, even among the bustling streets and towering buildings of the Financial District, signs of historic Jewish culture will be visible. Shearith Israel was surely crucial in laying the foundation which allowed for Eldridge Street’s genesis. As Lower Manhattan continued to grow towards the sky, the history of Shearith Israel’s early years continued to be buried further into the ground. But on its 289th birthday, the original Shearith Israel synagogue, and its influential congregants, received some long overdue city-wide recognition. Maybe “Eldridge Street Synagogue Way” will be next!